I don’t live by the water. Well, I live on a coast, but not overlooking the water. 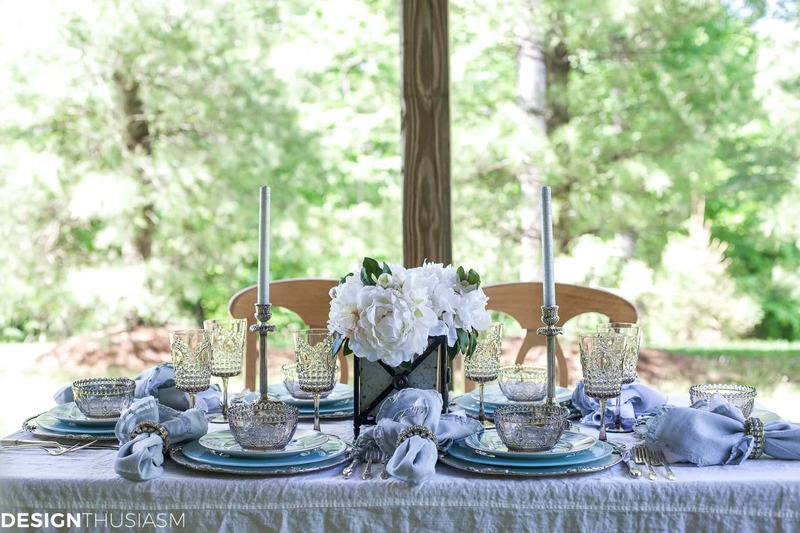 Yet, when setting an outdoor table for summer, it’s fun to bring the seaside to my table. Today I’m joining with a few friends to bring you some summer ideas, sponsored by Amara. Be sure to visit the other posts linked at the bottom of this one. 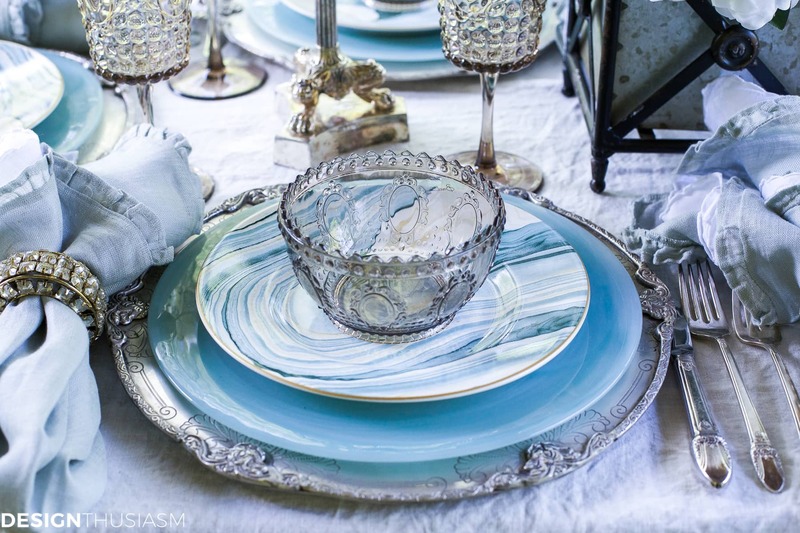 For this summer tablescape, rather than using actual beach motifs, my approach was more subtle, depending on watery blues and flowing patterns to suggest a seaside feel. The crowning touch is a lovely taupe bowl, provided by my sponsor, Amara. The real surprise is that the bowl is acrylic, a convenient option for outdoor dining, and is perfectly sized for fruit or ice cream. 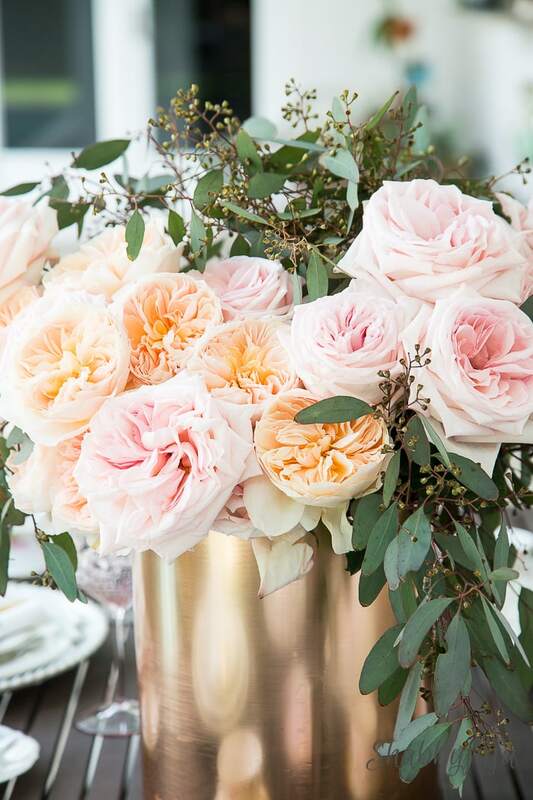 Another surprise is that the pretty centerpiece is, in fact, faux flowers. You probably know about my passion for fresh flowers and I even had some blue ones around the house, but I was so delighted by the quality of these white peonies, that I couldn’t resist trying them out on the table. The base of the whole setting is my washed linen tablecloth with ruffled edging, a nod to summer linens blowing in the breeze. 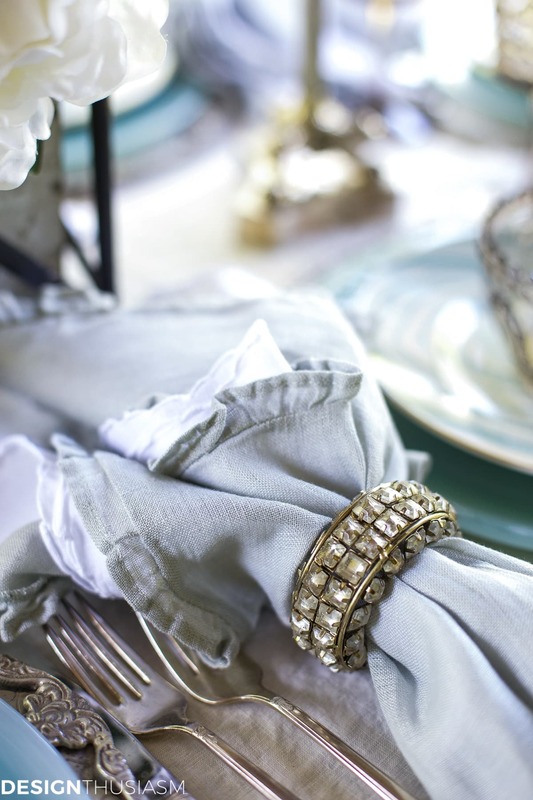 For napkins I clustered a ruffled blue linen over an embroidered white cotton, gathered together in my blingy crystal bracelet napkin rings. A closeup of the plate shows the beauty of the pattern and you can see why it evokes a feeling of coastal dinnerware to me. I’ve been wanting to get an outdoor farmhouse table but for now I just pulled out our old kitchen table to age naturally. We’ll have to see how that goes, but the chairs I keep inside when not in use. I also added silver candlesticks to the table, and I love how the cool tones make the taupe acrylic pieces look almost a silvery grey. If you’ve been reading the blog for any length of time, you well know my preference for items that don’t really match. The quest is always for an overall blend, in this case going for the peaceful feel of seaside decor. 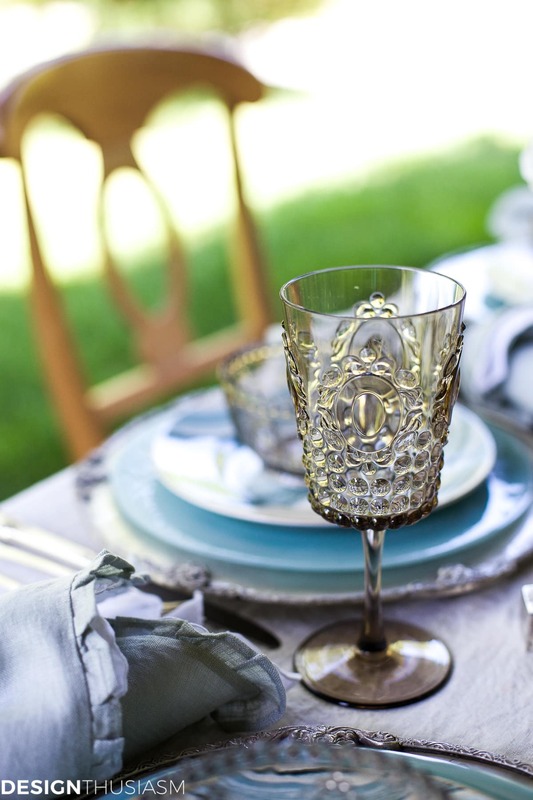 I’m crazy in love with the acrylic goblets and I’m so thankful to Amara for inspiring this tablescape! 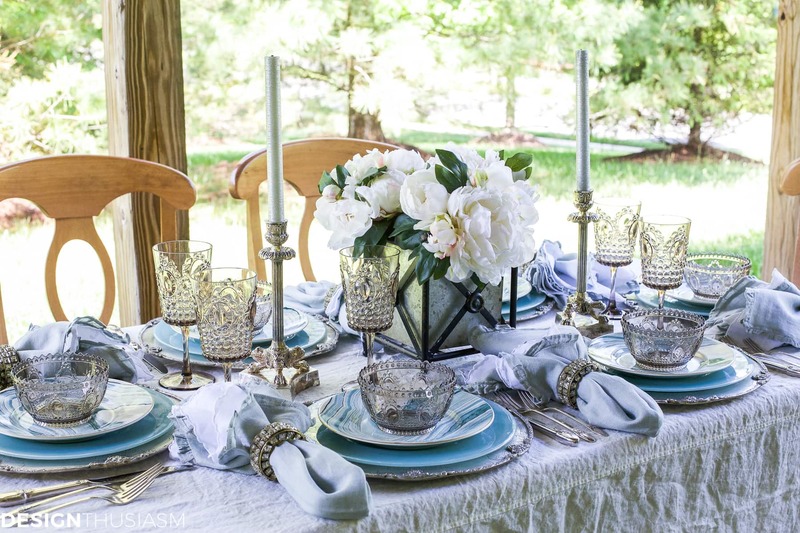 Lory, your tablescape is stunning as always! 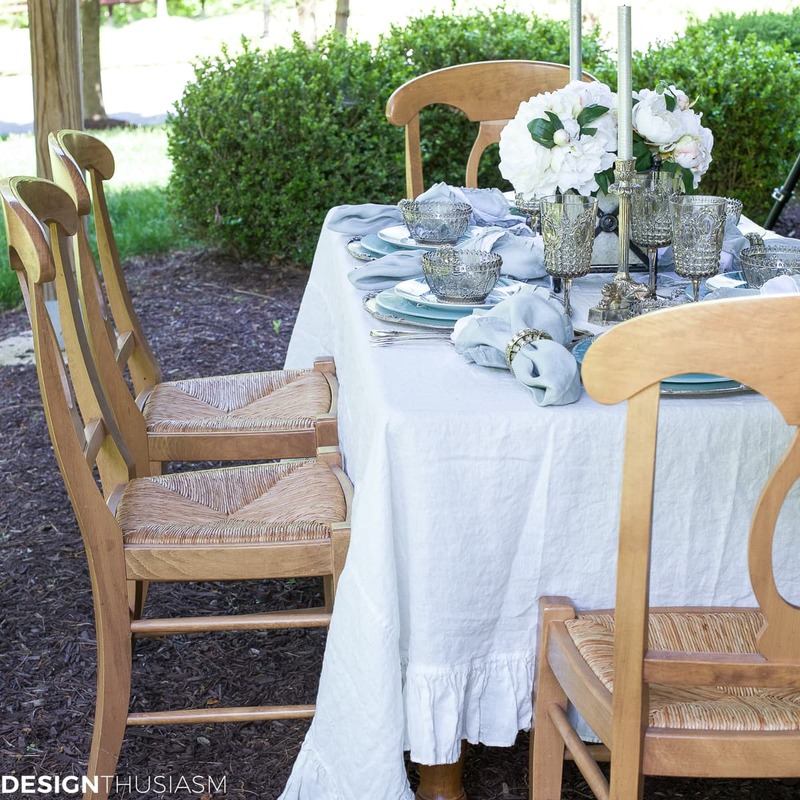 Such a pretty tablescape and good to see you finally enjoying some outdoor weather Lory! 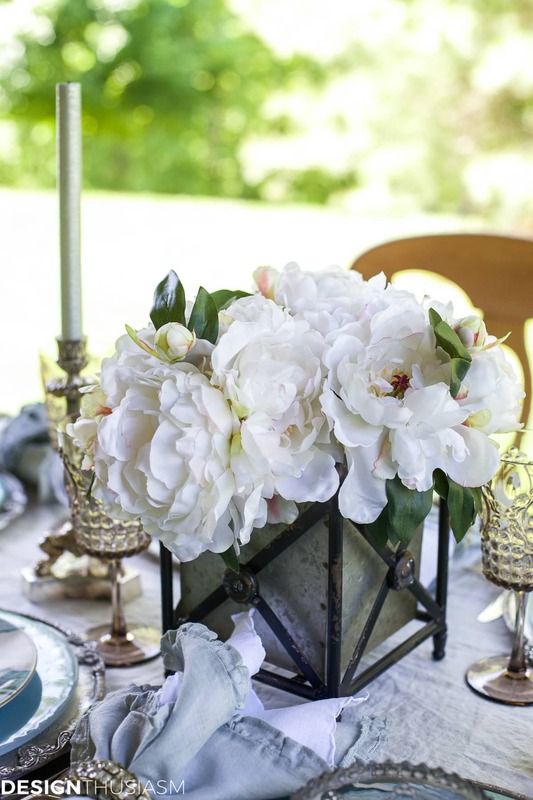 Beautiful tablescape – love the peonies ! Lovely! My favorite piece is the container that holds the flowers. 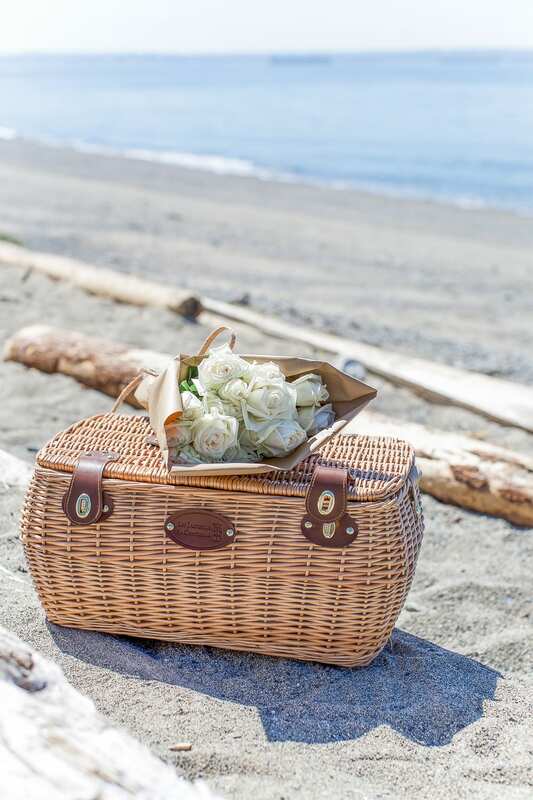 In that setting it reminds me of an old lantern, perfect for the coastal, casual vibe. 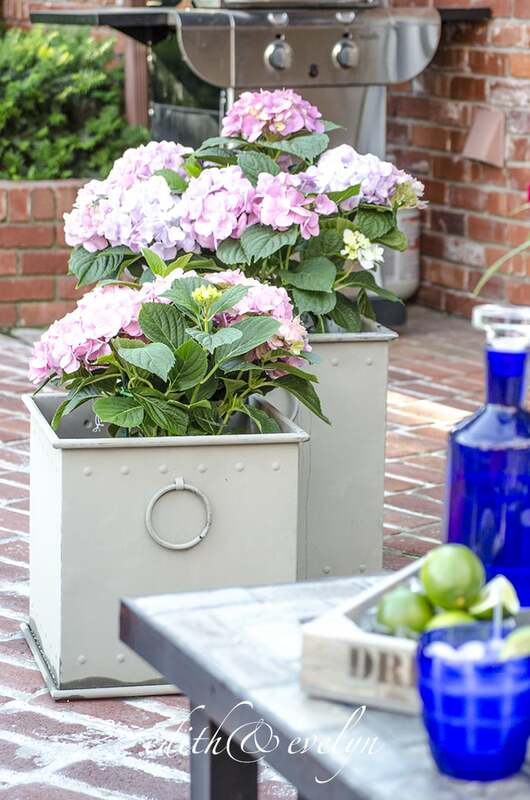 Source for the container? Thanks, Sharon! The container, as well as the peonies are from The Enchanted Home shop. Lory, that taupe acrylic is a knock out! And those blue swirls on the salad plates………..aahhh. This is a “must pin” situation! Sand, sky, and ocean blues. WOW! Lory, I actually have those two plates and can’t wait to combine them like this! Your table is gorgeous, as always. 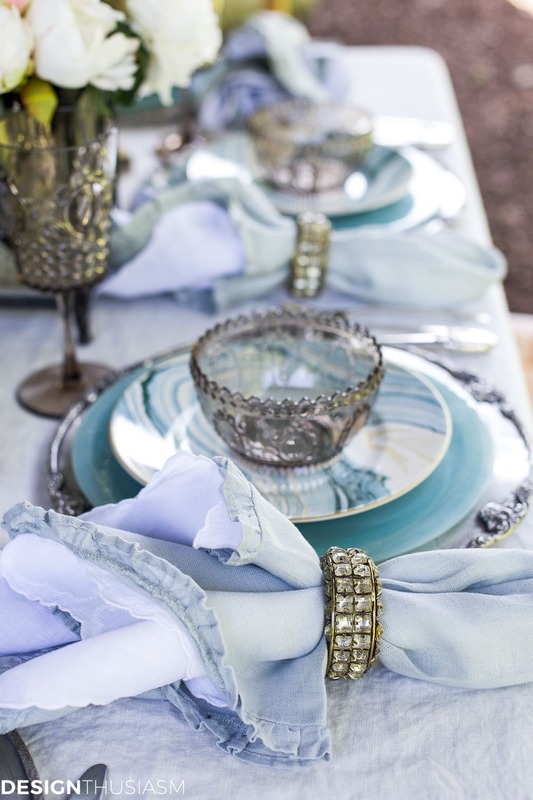 I always love the days when you showcase one of your tablescape creations, since our styles are so alike! This beauty is pinned. Thanks so for another beauty! You set the prettiest table Lory!!! 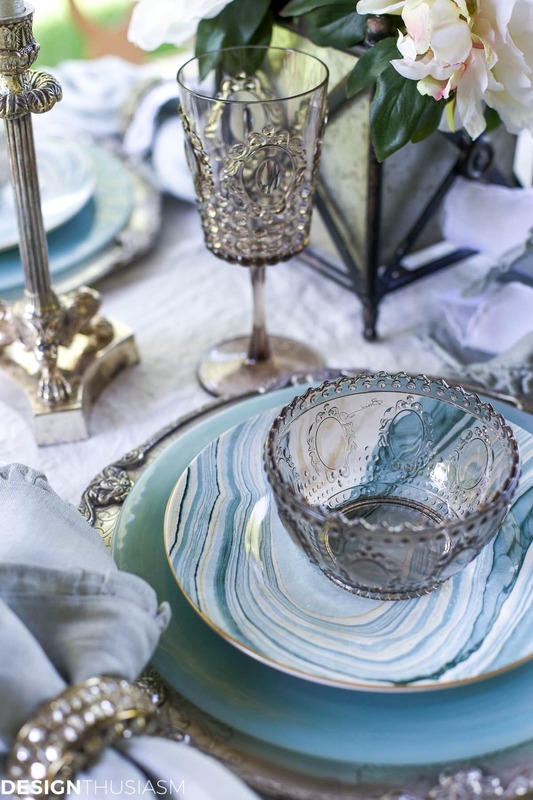 What a pretty coastal inspired table Lory! I love the marbled plates. You are a master of the beautiful table my friend. So gorgeous, Lory. I’m in love with those bowls (I swear they look like glass!) and those napkins. And the peony centrepiece of course. I’m interested to see how your table ages. Love your tablescapes! Thanks, Jamie! I’m guessing it won’t age well because it’s pine, but I was probably going to get rid of it anyway, so figured it’s worth a shot. Will eventually get something more vintage that’s actually meant to be outside. This is a beautiful take on this theme. The overall ethereal vibe is very relaxing just as a coastal dinner should be. I love how your tables are always elegant without feeling stuffy. Thank you for the inspiration! What a beautiful table!!! I can imagine your table on an ocean cliff overlooking the sea with the breeze blowing the tablecloth gently!!! You have taken me to a whole other place!!! Love those bowls, hard to believe they are acrylic. Very pretty and elegant, love the colors. I much prefer this to seashell/rope etc nautical, although that is nice if you love it. ‘ The Enchanted Home’ still has these silver chargers. I bought some not too long ago. 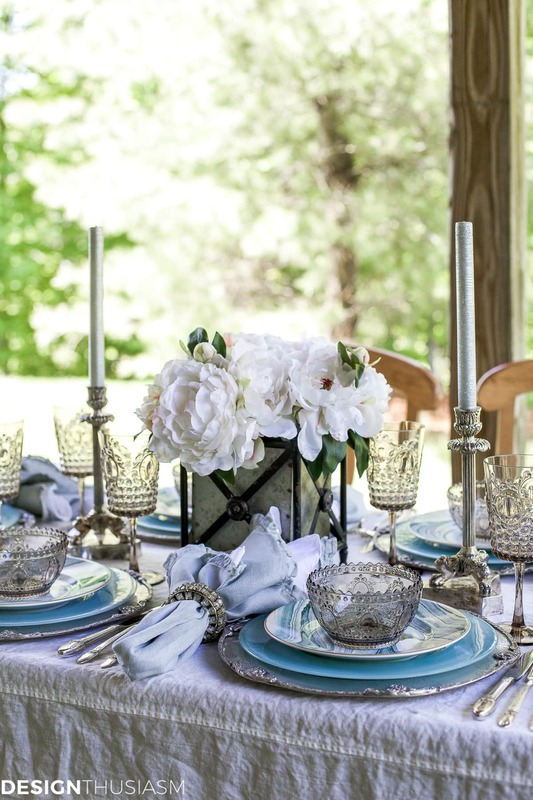 Beautiful Summer table outdoors. I love it cause it’s so fresh without suggesting any particular kind of motif for the plates. 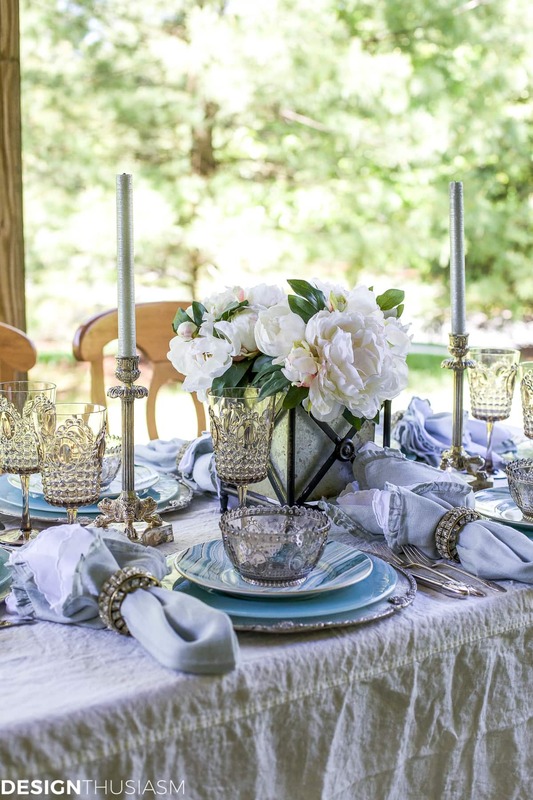 The faux centerpiece is just as gorgeous… my very fav are the stemware. Thank you so much, Fabby!! Setting a table seems easy, but it takes talent to pull everything together. 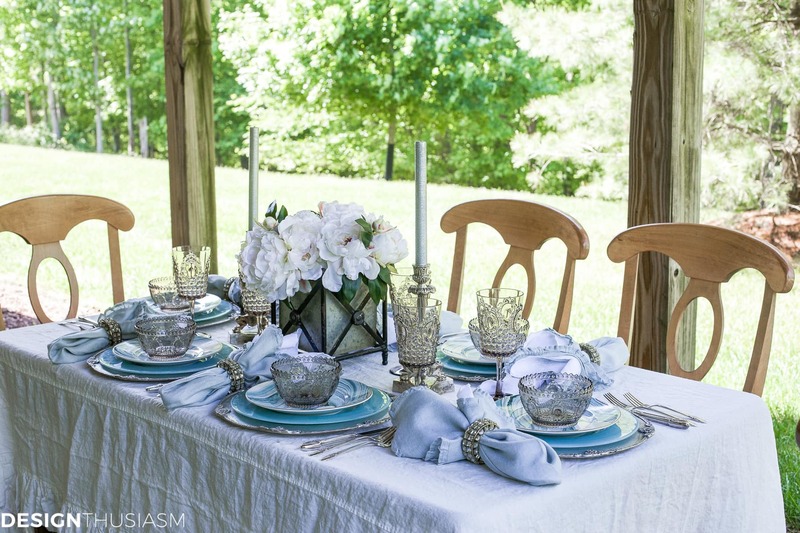 You always do such an amazing job at mixing elements to make a beautiful tablescape. Thank you for sharing your table on Merry Monday. What lovely thing to say! Thank you! !